My school has used an online gradebook system since before I started working there. 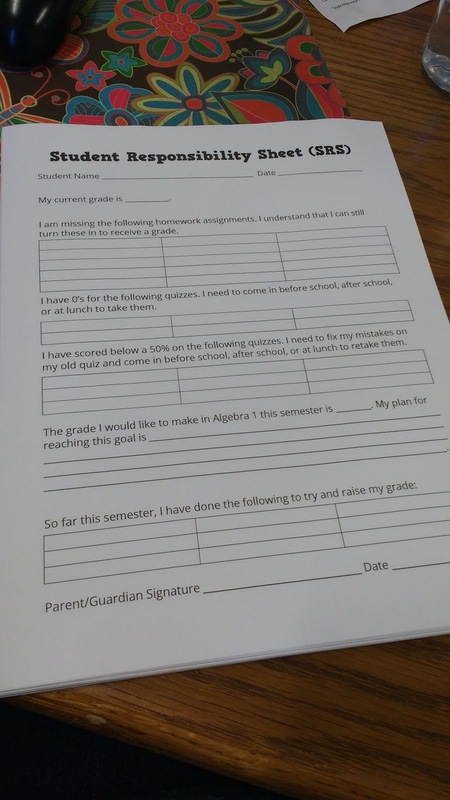 Students are given a password where they (and/or their parent/guardian) can check their grades in each class, check which assignments are missing, check their lunch balance, and check how many times they have been tardy/absent. It's an awesome system, but I find that the percentage of students/parents that take advantage of this system is depressingly low. A lot of this comes from working at a small school in a largely-poor, rural area. Many of my students do not have access to a computer outside of school. At school, their computer access is still greatly limited. There are only a few computers available in the library for students to use before school, after school, or at lunch. The school is equipped with wi-fi, but it is for staff use only. The only students who are able to use their phones to check their grades are the students fortunate to both have their own smart phone and have access to a data plan that is paid for by their parents. Despite these hurdles, I still want to encourage students to utilize the gradebook. So, I decided to create an assignment which I give ever 2-4 weeks. I'm calling it a "Student Responsibility Sheet" or "SRS." Next, they have to click on their grade breakdown and answer several questions regarding missing assignments, quizzes they have not taken, and quizzes they need to retake. Finally, I ask them to tell me which grade they are hoping to make in Algebra 1 this year and how they plan on accomplishing this. The answers to this question have been quite enlightening. One student who currently has a 98% set her goal for the semester as a 96%. I appreciated the fact that she was thankful for having a 98% but didn't want to set an unreasonable goal for herself to try and maintain that grade. I also asked my students to reflect on what they have done so far this semester to try and raise their grade. Answers vary from "Came in after school and at lunch to raise my grade up" to "I am doing all my homework" to "retook quizzes." The last step of the assignment is to get their parent/guardian to sign and date the paper. I passed out our first SRS on Monday, and it was due today, Friday. On Monday, students started filling out their SRS. 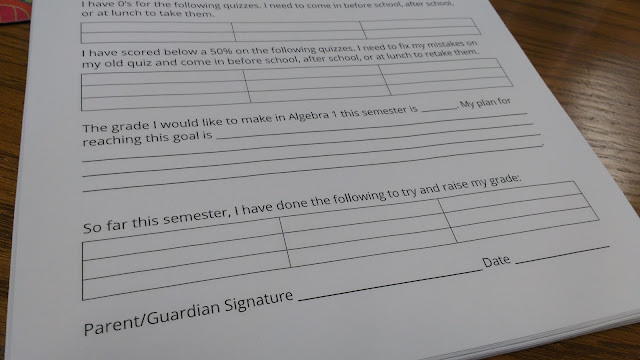 This led to them asking if it would be okay if they turned in some of their missing work and retook their quizzes before they finished filling out the form and showing it to their parents. Of course! That is kind of the goal of this sheet. I want students to be on top of what they are missing, so they can get the work turned in. In the past, students would come up to my desk and ask me what they were missing. Then, this would usually be followed by "Will you write me down a list of everything I'm missing." Or, they would want me to gather all their missing work and assemble it into one packet for them to do. I have wasted so much time doing tasks like this. Usually, students would lose the packet or never end up making up any of the missing work, so I really felt like my time was doubly wasted. Now, when students ask me what they are missing, I direct them to check the online gradebook. I feel a bit harsh doing this, but I know it is for their own good. If they tell me they don't have internet access at home, I let them out of class to use the computers in the library. More and more students are checking their grades on their phones, and this makes me happy. It turns out a lot of students have phones and data access, they just had never got around to getting their password to check their grades. It was easier to ask their teacher what they were missing instead of asking the office for their password. I do feel the need to say, in full disclosure, that this method of making students more responsible is not foolproof. I'm only a week in, and I'm seeing some positive results. I'm also seeing some not so great results. 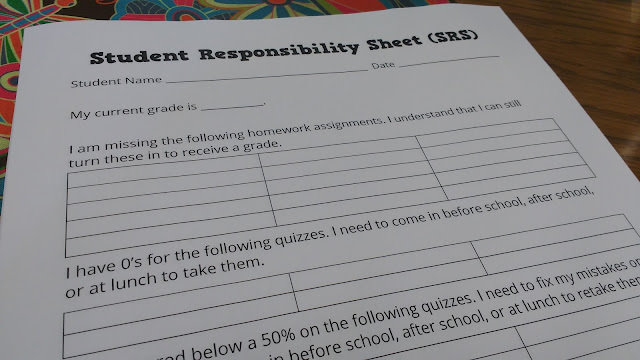 They aren't exactly negative results, but I have many students who haven't completed their Student Responsibility Sheets at all. Of my 44 Algebra 1 students, I have received 13 SRS sheets. That is roughly 30%. I still have students failing. I still have students with missing work. I still have students with zeros for quizzes. I still have students who need major help but haven't reached out for it yet. But, I have made a start. This problem will not be fixed over night, and I need to keep reminding myself of this fact. Next week, I will give out a new SRS to each student who failed to turn one in. And, I will start checking in with parents of students who haven't returned theirs. If you're interested in seeing a copy of my form, I have uploaded it here. I look forward to sharing how I tweak this system in the future. I like that you do this every couple of weeks. I have a sheet that I use at the end of each quarter for students to reflect on their grades and why they are what they are. I use it at the Parent Conference Day (we do these in Asia, and I am booked solid for 2 days). This seems to be the missing piece to my grade reflection sheet. Please bear with me, the old memory machine isn't what it used to be...I hope I don't botch this question too much! When I first started following your blog I think you used a grading system that consisted of A/B/Not Yet --- what ever happened to that? Does it still exist? Did it change? Go by the wayside? Would love to know the hows and whys of what happened? I thought it sounded like such an interesting concept.